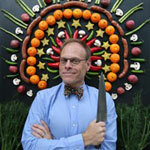 The Pullo Center welcomes Alton Brown Live - The Edible Inevitable Tour to its stage February 19, at 7:30 p.m. Ticket prices are $85 and $56, and are on sale now. Tickets can be purchased at The Pullo Center Box Office, charged by phone at 717-505-8900, or online. With his upcoming tour, Alton Brown brings his brand of quirky humor and culinary-science antics to the stage. The ninety-minute show is a unique blend of stand up comedy, food experimentation, talk show antics, multimedia lecture, and, for the first time...live music. Audience interaction is strictly enforced throughout the evening, though if you’re called upon as a culinary assistant you’ll definitely want to take the lab coat Brown offers, as things tend to get messy. Brown has worked his weird magic on live audiences across the nation for over a decade but this is the first time he’s actually hit the road with a live tour. The entire family will have a blast, especially as you sing along with Brown’s soon to be hits “Airport Shrimp Blues” and “TV Cookin Ain’t Like No Other Cookin”.